Folio: 31.4 x 21.5 cm. 428 leaves, 48 lines, two columns. Collation: “1”8, “2”10, a-m8, n6, o-p8, q6, r-z8, A-L8, M10, N-Y8, Z6, AA6, BB-FF8. Complete. With all three blanks, a1, B8, and FF8, present. The BMC collation, calling for 8 leaves in signature n, is erroneous. This is an extraordinarily fresh, complete example, rubricated throughout in red, with smaller initials and capital strokes. The leaves have very wide, clean margins throughout. 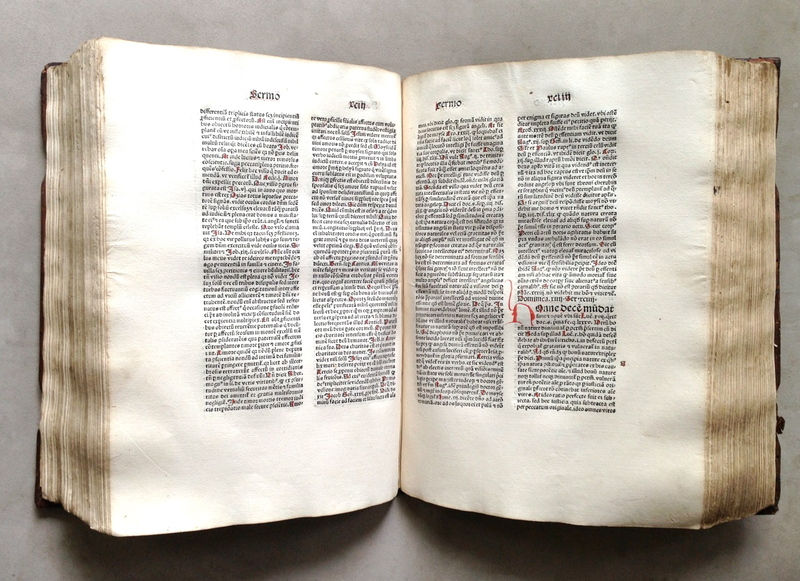 Leaves d1-3, 6-8, N3 and 6 are printed on smaller (chancery) sheets, entirely untrimmed and with their deckled edges preserved. With a neatly written, contemporary inscription to the recto of the first leaf, identifying the work: “Daily and Seasonal Sermons, Sermons for Saints’ Days, On Penance, and The Coming of Christ on Judgment Day.” This copy has only the most minor of faults, hardly worth the mention: a small smudge to leaf f8, a light dampstain to three leaves (A7-8, C2), slight worming at beginning and end, contemporary ms. note to first and small ownership inscription to second leaf. 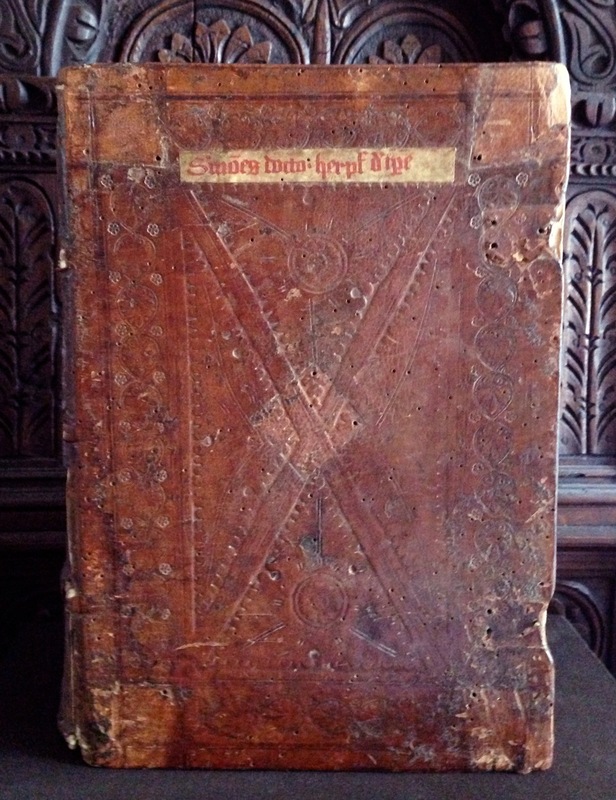 Housed in a custom box with the gilt label of the Bibliotheca Philosophica Hermetica. 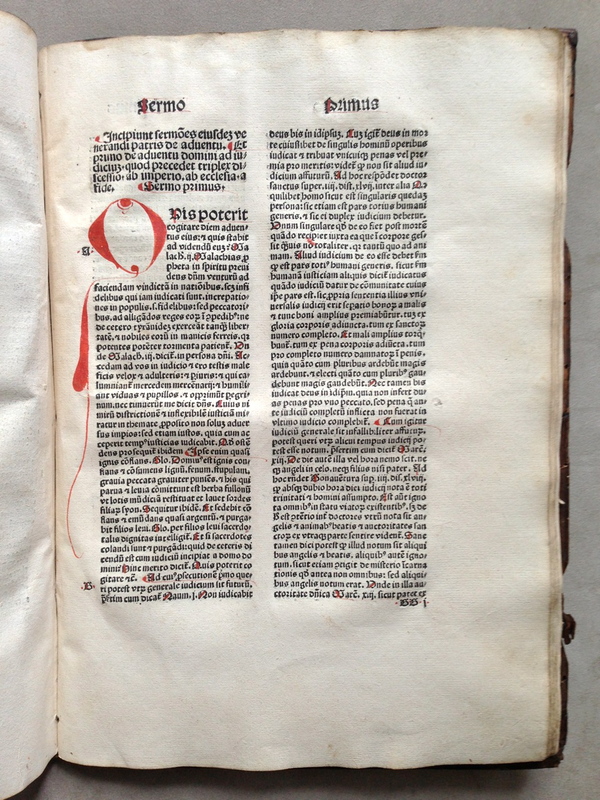 Peter Drach (d. 1504) operated an extensive printing and bookselling business from Speyer, situated on the Rhine, near Heidelberg in Germany. He participated in the Frankfurt and Leipzig book fairs, and his sphere of trade extended from Antwerp to Bohemia, and from Lübeck to Rome. Drach also sold books in the business centers Nuremberg and Augsburg, and in the university cities of Tübingen and Heidelberg. His most famous client was the humanist Jakob Wimpheling. The Dutch mystic Henricus de Herpf (d. 1477) had a profound impact on later mystical writers, including Francisco de Osuna, who in turn influenced St. Teresa of Jesus. 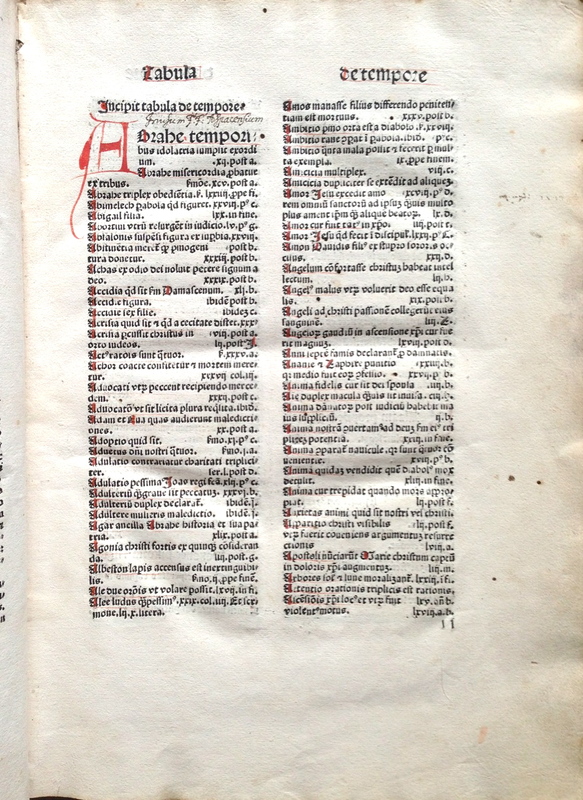 From 1445, Herpf was a rector of the Brothers of the Common Life in Delft and, later, in Gouda, where he encouraged book production in particular. In 1450, on a pilgrimage to Rome, he joined the Franciscan Observance (the Capuchin reform) at the Convent of Ara Coeli. Upon his return to northern Europe, he served in several posts for the Franciscan Observants of the Cologne Province, including as provincial of the Province of Cologne (1470–73), then guardian of the convent of Mechlin in present-day Belgium, where he died in 1477. “Herpf’s sermons concentrated on the explication of text and teaching through Scripture. The third sermon deals at length with drinking to excess. Perhaps because of his reputation as a great preacher, Herpf is mistakenly identified here as a member of the ‘praedicatorum’ (Dominicans). 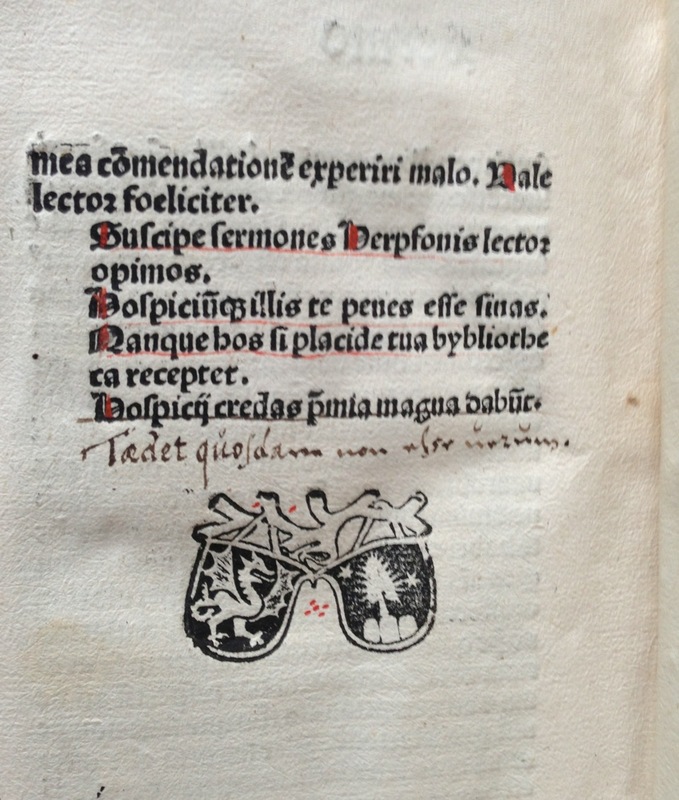 The mistake was caught during the press run, and corrected in print in some later copies to ‘minorum’ (Franciscans). This copy has the identification corrected in a contemporary hand, probably that of an employee in the printing shop.” (M. Ford, BPH catalogue). Bibliographical references: HC 8527; GW 12225; BMC II, 493; Goff H-38; ISTC ih00038000; Simon, Bibl. Bacchia I, 118 & Gastronomica 839.